"This new Booze Brother album is a superb imaginary experience that will take you to the most festive pubs or to the Irish moor for its subtlety." If phonetically the name Booze Brothers can be confusing for us Frenchies, it means much more than it seems by taking many rather striking references. "Booze" in English means drink, beer or booze. Allied to the term "Brother" it refers to John Landis' famous film "The Blues Brothers" to become the "Booze Brothers". Thus, the name reveals a strong identity based on friendship and a sense of celebration. The Toulouse group was born in 1998, the year of France's first victory at the World Cup, a reason to celebrate with a great deal of alcohol. While in its early days, the group was content to cover Pogues tracks and play Irish folk music, very quickly the first compositions arrived on this Celtic folk basis with a touch of punk. This new album reflects the change of tone adopted in recent years, namely a harder style while naturally retaining the Irish foundations that bring a festive colour to the music as evidenced by 'Black and Tans'. The track begins in a refined, very folk way, then turns, with great riffs, towards a much more rock and intense suite with a mutinous accordion at the end. The listener is transported in the middle of St Patrick's Day to pubs in Dublin, where the scent of Guiness will intoxicate his nostrils. Booze Brothers undeniably knows how to compose songs cut for the stage to extract devilish pogos and smiles from an audience that gets off on listening to "Burn My Way" whose beginning reminds us of Stomp with his rhythmic underpinned by a mischievous tin whistle. The strength of the group is also to bring nuance to a subject that is not only rebellious, like "Boozing" which starts calmly and then sails between lulls in the verses and rage in the chorus. This track is a little bomb that leaves the instruments to express themselves: the accordion carries the melody and around it is grafted a well-packed guitar solo. Another piece of bravery is 'Not Afraid To Try' which under its drinking song look hides more subtleties than it suggests. But Ireland is not only at the heart of the project, the band does not hesitate to draw, in the manner of an appointment in an unknown country, into the Balkan culture in "Wild Rover IV", which is undoubtedly the best track on the album as the fusion works in an incredible way. Like many albums of this type, the opus ends with an acoustic and almost nostalgic "Happy" as if leaving good friends at the end of the evening with a relative sadness. 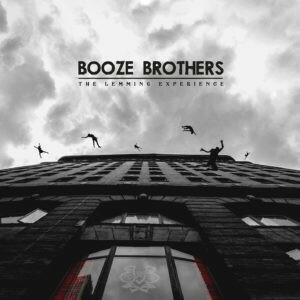 This new album from the Booze Brothers is an excellent surprise. This disc is of immeasurable energy, at once subtle, wonderfully composed, arranged and interpreted. "The Lemmings Experience" is a call to revolt, to celebration, to friendship that can be listened to with pleasure and that, without a doubt, will take on its full dimension on stage.